Let’s say for the sake of argument that you’re new to the whole financial side of Magic. You’ve traded a bit at your local store, you’ve overheard discussions about how X card is worth X price now, and you’ve bought cards on TCGplayer or SCG before. Now you want to become financially savvy, and make the most out of how to sell your cards at their peaks while buying cards at their lows. There’s a whole pile of articles out there to help you do that. One of the more recently published comprehensive guides to selling a card was written by our own Travis Allen, and is a great place to start. Unfortunately, the card you sold doesn’t just magically disappear and transform into those crisp dollar bills we all know and love. It’s not like all of your cards are double-faced, where the other side holds real (your country here) currency. You have to ship the card to another human being (or store, but for the sake of this article we’re assuming that you will be selling to other people). A person that has hopes, dreams, and emotions. Just like you. Instead of focusing on bulk today, I’m going to try and go over one of the oft-forgotten aspects of this whole #MTGFINANCE thing; customer service. We’re going to look at some common mishaps and situations that sometimes occur when a buyer purchases a card from a seller, and then talk about some solutions and practices that each party can remember to help approach a resolution. I’ve been on both sides of these situations, and can understand how frustrating it can be. This is one of the more common things that will cause a buyer and seller to interact with each other when working through a platform like TCGplayer, eBay, or Pucatrade. These websites generally allow the seller 6-8 business days before the buyer can take action, to account for sometimes slow service by the USPS. Sometimes time passes, and the card still hasn’t shown up. So what do you do as a buyer? What do you do as a seller? You might already be thinking that almost every situation where this has happened can be preemptively solved by shipping with tracking, and you’re not wrong. Shipping securely in a bubble mailer with a PayPal shipping label for $2.45 is a (relatively) cheap way to increase the probability that the package will reach its’ destination. Unfortunately, that’s not always economically viable for either party. 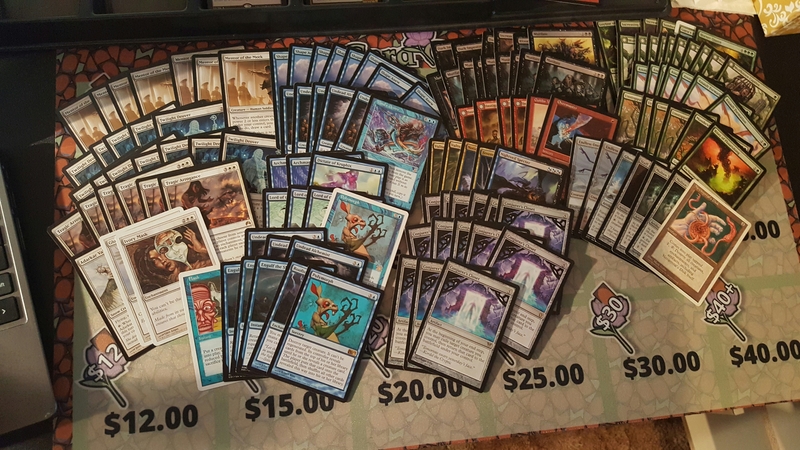 If I buy an Overgrown Tomb from a local player at $4 and then ship it to someone over Facebook for $7, there’s literally zero point in me putting tracking on that card alone unless I pass those shipping costs onto the buyer. In that case, the buyer will gladly purchase the shockland from some other venue where he/she can avoid paying close to 30% more. My personal rule is that I provide free tracked shipping for any order totaling $25 or more. My margins are safe enough at that point to make it worth tracking, and it encourages the buyer to purchase more cards to hit that number. For orders totaling $24 and under, I ship in a PWE (Plain white envelope) with a stamp. There are a bunch of other articles out there on how to ship a Magic card safely and securely, so we won’t spend anymore time on that here. If you’re purchasing cards from TCGplayer or eBay, remember that the expectation is on the seller to get you those cards in that 6-8 business day window. If you order cards on a Saturday and they’re shipped out Monday morning, it’s not the fault of the buyer if those cards don’t arrive in time for your Friday Night Magic (unless you specifically agreed to and paid extra for expedited shipping, but TCGplayer doesn’t allow this). Give yourself that window of at least a week and a half for the cards to arrive, or be ready to pay the extra shipping cost. Okay, so now it’s been 9 business days and your Grafdigger’s Cage that was shipped in a PWE still didn’t come in the mail. You’re not happy. I get that. However, it’s not exactly going to reflect well on you if you use the TCGplayer/eBay/Puca messaging system to immediately berate the buyer and demand a refund, or by leaving scathing feedback. Our USPS system is far from perfect, and sometimes stuff gets lost. This is the part where you politely message the seller, and let them know about the situation. Your card(s) didn’t show up, and you waited the appropriate amount of time. If the seller knows what they’re doing and takes the actions that I’ve detailed in the next few paragraphs, they’ll make it right with you because they don’t want to lose your trust (and your future dollars) as a seller. We all dread this email (or Twitter/Facebook) message. Some variant of “My cards still haven’t shown up yet..” While the dollar value isn’t going to be too high if you’re using tracked for high-end orders, it’s still annoying to think that you might have put the wrong address on the PWE when mailing out those orders. So what do you do? First of all, don’t accuse the buyer of stealing or lying. That’s not going to get you anywhere close to a positive feedback review, and it doesn’t help to resolve the situation. If you do feel like something is sketchy, I would absolutely send a report to the real customer service representatives at TCGplayer or eBay (although I highly doubt eBay will do anything to help the seller). At the very least, the platforms can keep track and see if the buyer forms a pattern of making the same claim to other sellers on a regular basis. Secondly, don’t just immediately apologize and refund the order. This is a big mistake that I’ve heard happens a lot. Most players will still want that card instead of just their money back, because then they have to go through the process of finding another copy for the same price. If you do own another copy of that Grafdigger’s Cage, just ship it to the buyer. Double Triple check the address and name on the PWE, and take extra care to make sure that it’s being dropped off at the post office instead of just leaving it in your mailbox and risking it getting stolen. This is the other common issue I’ve run into, as both a buyer and a seller (Not that I run into this often as a TCGplayer seller….). Different people are taught how to grade Magic cards differently, and those opinions can clash when one party receives a card that they believe is in a worse condition than what they ordered. Even some of the superstores like SCG, Channelfireball, and Cardkingdom have different grading scales; I’ve bought cards from SCG at “Moderately Played” and immediately sold them back to Cardkingdom where they were graded as “Slightly Played”. This might start to sound repetitive, but the first step is to contact the seller without exploding in a fit of rage. Sometimes there’s a mark on the card that was only visible in a certain light, and sometimes two cards from inventory get swapped on accident so someone gets MP and the other person gets NM. It happens, we’re all human. While not an absolute law, it’s a good rule of thumb to follow that an LP card (in place of NM) gets a 10% partial refund, MP gets 15-20%, and HP is 30-35%. It helps if you have pictures of the card that you received to help make your case, although TCGplayer doesn’t allow buyers and sellers to send images between each other so you’d have to provide email addresses or imgur links. This is not an excuse to go around and complain to every seller you buy cards from, and think of yourself as a “super harsh grader”, which is something I’ve heard before from a buyer. There are some buyers out there who think they can get 10% off every single purchase just by claiming LP on the cards they buy, expecting a discount. This behavior is absolutely kept track of by TCGplayer and Pucatrade, and crying wolf will leave you helpless when you actually get sent a MP card when you wanted NM. Look at the card from multiple angles of light to see if it has any markings that are invisible from only one perspective. Water damage, scratches, and grime are all more elusive forms of wear that go unnoticed without proper grading, and it’s always better to get that customer feedback that says they expected a worse for wear card rather than the dreaded email saying that their NM card was actually LP. Grade what the card actually is, instead of what you wish it was. This is especially true for foils, where a buyer of a NM foil is much more likely to be more critical. I spent way more words than I expected to while writing this, but I think that’s fine. If this gets a positive response, I’ll write another one next week where I go over more niche and advanced scenarios involving customer service to ensure that even strangers come back to you for repeat business. I still believe that this is a hugely under-reported aspect of this #MTGFINANCE banner that’s all the rage right now, and some people are going to get in over their heads. On a closing note, remember that as a TCGplayer/Pucatrade/eBay salesperson, you are your own Public Relations person. SCG, CFB, CK, ABU… They all have a person specifically trained to deal with situations like the ones stated in the article. When you decide to become an independent seller, all of that burden goes to you and you only. Even if it looses you a few dollars on a transaction when you have to give back 10% to someone who you didn’t think deserved it, that customer service will make them more likely to come back to you again and again. I’ve got one more article up my sleeve in that little “trilogy” if you want to call it that, but it can wait until next week because this article is unlike most of my others in that its’ time sensitive. We haven’t really talked a lot about Eternal Masters in this column because buying those cards at retail and crossing my fingers isn’t normally how I operate. I’m in a fortunate enough situation that I’m one of the only “buylists” within about an hour drive, so a lot of collections and singles at buylist just come my way due to word of mouth. A lot of my writing has been geared towards helping you be that guy, or how to get around being region locked if you’re forced to compete with a huge store. This article goes against the grain in that it’s a strategy that I wouldn’t personally use because of how I’m “region locked” out of it, and the margins are too low for me when I have individuals selling me cards at buylist. However if you live in an area where trading as a whole is still alive and well, then you might be able to use these tips to pick up some cards with a low buylist-to-retail spread in trade, or build a deck for cheaper than you might otherwise have to pay for it. It’s no secret that the difference between the low and mid spread on Eternal Masters rares is pretty thin already, with some rares being available on TCGplayer for 60% of their “median” value. Look at the “featured seller” in the top right of each of the below pictures to see what I mean. This drops even further if you’re a smart consumer and use Facebook/Twitter to purchase your cards at 10-15% less than the available low. Even if we haven’t hit the absolute possible low that the card will ever reach, we’re damn close enough that I feel comfortable in this strategy. That is, if you have a highly active local group of traders who aren’t sharks. Maybe you can already see where I’m going with this. If you’re located in an area where trading at TCG median is still relatively common, then it’s possible to buy cards at 60% of the TCG median, then trade them out for cards that have a significantly lower spread between the buylist and retail. Do I know of any such cards? Well, here’s a couple of hitns to get you started. There’s a ridiculous spread on certain competitive Slivers right now for whatever reason, at least according to SCG. They’re paying almost retail to fill up on cards that are played in the Modern slivers deck, and you can find these in binders for $4-5 each. Based on our previous discussion, here’s an example arbitrage purchase and follow up trade you can make. The cheapest available NM Sinkhole on TCGplayer right now is $9. If you go on Facebook/Twitter right now, scour through the various groups/backpack grinders, you can probably find one or several for $8. When those come in the mail, you walk into your LGS and say “I’m looking for Galerider Sliver and Sliver Hive. I have Sinkholes (or whatever EMA card you bought). If you find someone with Galeriders that you can trade for at $4.50 (their TCG median price as of 6/21/16), then you can get three copies plus a dollar throw-in for your $8 Sinkhole. Is this highly specific scenario going to occur every time? No, of course not. In fact, there’s more than a negligible risk involved because we’re waiting on our TCG/Facebook/Twitter seller to ship the card and arrive 3-4 days later, then we’re hoping that SCG’s buy price on these Slivers holds strong over the course of that week. I’m not to worried about that latter fact in this example because Slivers are such a strong casual pickup in the long run, but I think you get what I mean. The “worst case snenario” here is that you paid $8 for a Sinkhole, which I think is still a pretty fine buy for the long haul if you’re into long term speculation on Eternal Masters singles. It’s certainly not a foolproof arbitrage strategy and it’s not even something I’ve tested personally, but it’s an idea for those of you who still have a lively trading scene at your LGS or PPTQ. Personally I have to pay state sales tax on anything I purchase from TCGplayer, so any small spec target I buy from there is automatically slightly less attractive. While most individuals in this community use the term “buyout” incorrectly, this would be one of the few examples where the word rings true. It’s highly unlikely that the card will fall to its’ previous low of $350, but there will be at least a few people who decide that $700 is a little high for a card in their Commander deck, so be looking for those to hit the market on TCGplayer or eBay. There’s also the option of grabbing Italian copies for significantly cheaper, considering the Master Buyoutmancer didn’t touch the foreign copies. For what its’ worth, there are two NM copies on TCGplayer for $400 each as I’m finishing up this article. I’m tempted to grab them, but that NY sales tax really bites at that high of a number. I think I’m gonna leave them alone for now, as I don’t want to risk that amount of capital on a card that I’m not confident people are ready to buy into post-spike. I’ll see all of you next week, when we return to a new discussion on bulk rares. Thanks for reading! I hope everyone had a great weekend of Eternal Masters releases! I’m currently crying over the insane amounts of value I lost with the release of the set. I was speccing so hard on a certain spec target, and I lost all my spec money when they reprinted my speculation into the speccing ground. Ugh. Jokes aside, I had a pretty solid weekend. 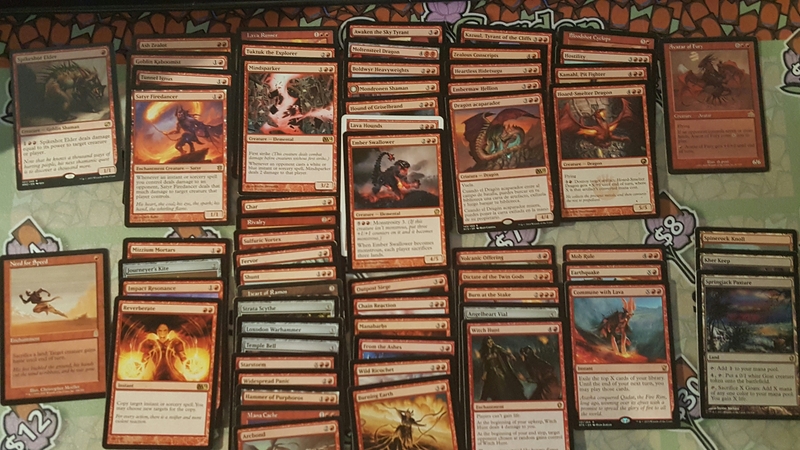 I was literally the only player in my 8-man pod drafting blue, so I ended up with this monstrosity of a deck on Saturday. The Counterspell and Peregrine Drake are foil, for added value. (After some advice on Twitter, I ended up playing 3x Plains and the Swords+Faith’s Fetters to a 4-0 success). You’re not here to hear my tournament report though, so let’s talk a little finance. While we’re on the subject of Eternal Masters for the first time ever in this column (We probably won’t come back to the set unless we get to talk about bulk rares), so let’s discuss foils for a quick minute. Remember that foil Peregrine Drake? While it was great at stealing games in the sky, it was also worth drafting for value because I don’t hate money. 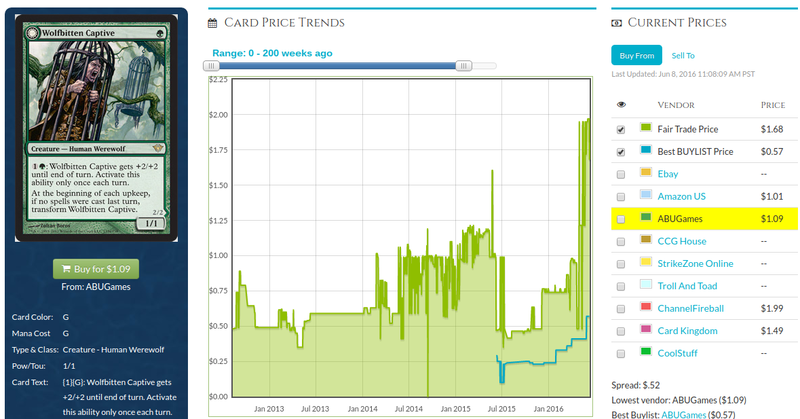 I quickly skimmed the TCGplayer website while I was building my deck, and glanced at the median price. $12 bucks looks pretty sweet for a foil common, right? Even if we look at the article written a few weeks ago by a certain handsome #MTGFINANCE person, we can safely assume that the Median is a slightly incorrect way to determine the true value of a card. 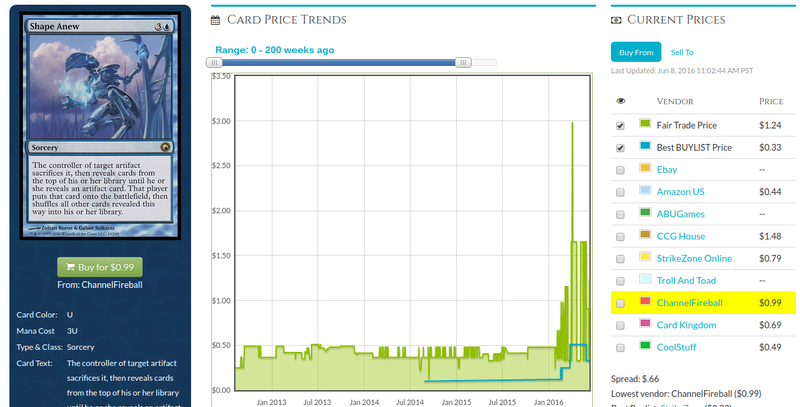 Pretty much every card we normally look at with a TCG median of $12 can be realistically sold for around $9…..
Oh. I guess that’s a thing. 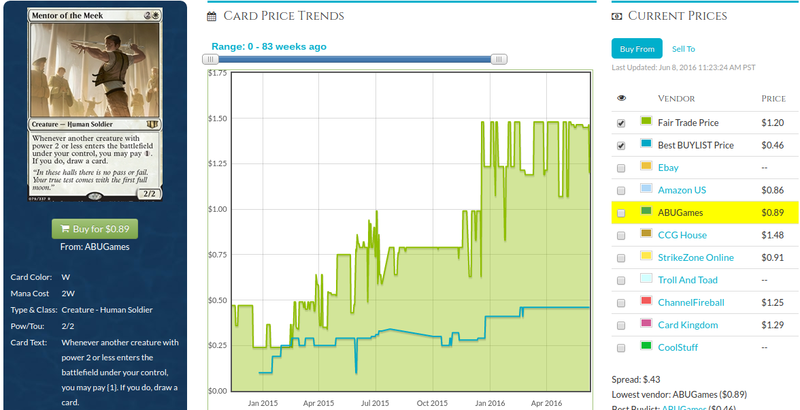 (In case you were wondering, yes that’s a foil Peregrine Drake listed on TCGplayer for $.29 by Adventureson. Someone made a tiny mistake). 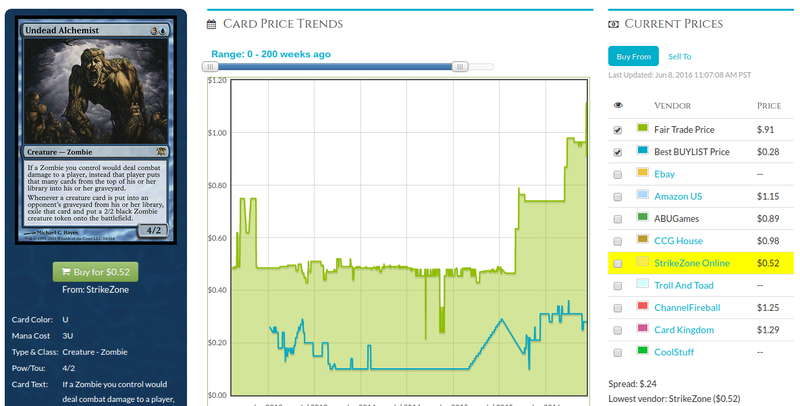 Other than that minor outlier, we’re still looking at a ridiculous spread difference between the TCG median and the lowest available buy price. If you find someone on the hunt for EMA foils, you’re definitely better off trading at TCG median for cards that aren’t Eternal Masters foils. There are people out there who will revere TCG median as their bible, so it’s technically possible if you can actually find other human beings to trade with. I personally haven’t traded cards out of a binder for other Magic cards in multiple years, but you do you. If you’re really lucky (or using some sort of Pucatrade bot), you might be able to ship out a copy for Pucapoints but you’ll be dealing with a significant amount of competition from everyone else who cracked a box and wants to fufill the dream of getting all their money back. On the other hand, this is a great situation if you’re in the market for EMA foils. While we’ve mostly passed the all-time low (I paid $20 for a foil Maze of Ith on eBay, and it felt good, you’re still not in a terrible spot to buy foils for you cube, Commander decks, or long term speculation. While the TCG median is an arbitrary number that we can’t technically attach a real market value to, it still feels really good paying 25-40% of that number when so many sellers are desperate to recoup their value from Pandora’s Booster Box. Oh, right. Last week I talked about Bulk Rare EDH, and this week I’m gonna talk a little bit about my adventures of building a cube by picking through thousands of bulk rares. I set a few rules for myself similar to the EDH restrictions, but I couldn’t find a way to realistically only use rare non-basic lands that were all under $1.00 without the cube being a pile of garbage. I mean, the 360 card list will still probably be close to garbage value-wise but I do want it to actually be fun to draft repeatedly. It’s for that reason that I ended up taking out the Land Cap and friends cycle, which I’m sure my drafters will forgive me for. Lands are exempt from this rule, because nobody I know wants to be forced into mono color decks. I couldn’t really think of a ‘hard limit’ for lands, but I’m trying to cut it off at the $3 range for higher end cards in cycles like Temple of Epiphany. No shocklands or Innistrad buddy lands, or anything like that. There are a few cards in the cube that currently break the second $1.00 TCG mid rule, because I’m expecting them to rotate or go down in value sometime soon. Stratus Dancer and Hidden Dragonslayer. I don’t expect this cube to be finished or drafted until a couple months from now, so I’m trying to lock the list down for then. Every cube needs sleeves. With the amount of shuffling, table sliding, and flicking these cards are going to get, it’s important to get a set of long lasting sleeves that will protect the cube for an extended period of time. Even though almost all the cards in my cube are near-worthless, I’d prefer to avoid having them ground to powder and having the HP cards be indistinguishable from the NM ones. Speaking of condition, another benefit of building a cube was that I got to use up a ton of the MP and HP bulk rares lying around that I couldn’t put into my $.25 bulk rare boxes. Most of my non-competitive players don’t like beat up cards unless they’re getting $5 Gilded Lotuses off me, so my damaged bulk ended up gathering dust in a 1k box. Anyway, sleeves. Right. So a few months ago, I knew that I wanted to build a cube but I was too busy with school stuff. I also had to resleeve all my EDH decks, so I wanted to buy a large quantity of high quality sleeves in bulk. After asking around and doing a bit of research, I was determined to try out the Hareruya sleeves I had been hearing about. I dropped the money required to order two cases from Japan (enough to sleeve five Commander decks and a large sized cube, with enough leftover to sell to friends who couldn’t attend Grands Prix). It ended up coming out to $4 per pack of 50, which is a better deal than any $10 packs of 100 Dragonshields that I’ve been using for the past couple of years. I’ve been thoroughly impressed by the quality of the sleeves, although I can’t speak to their endurance when used for 5-6 hours a week at lengthy events. While I bought these back in April, you can still find them readily available by the pack at a Grand Prix for $5 per pack if you don’t have plans to drop a hundred dollars on sleeves. River Kelpie continues to creep up. It’s a low-stock Shadowmoor rare with no reprints, so I guess the supply is just bottoming out. 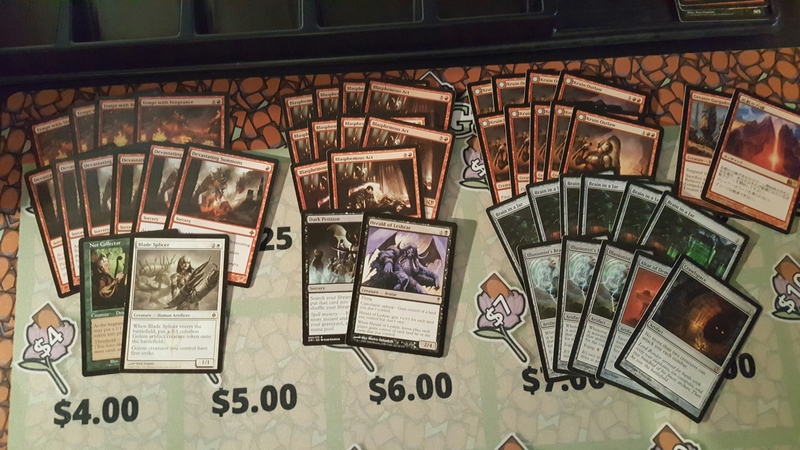 I bought 30 from SCG at $.50 each, and I’m accepting that it’ll probably take a while to unload all of these to 30 Marchesa, the Black Rose players. Thought Lash is a really terrible card that you can give to your opponent with Zedruu the Greathearted, but it’s a $4 card now. Thankfully it’s on the Reserved List so we don’t have to worry about a reprint in Kaladesh crashing the price of our beloved enchantment. Apparently Day’s Undoing is being tested out in the mono blue prison deck in Standard. I agree with Travis Allen that this is a solid long term hold because it seems like something that could be broken later on when Wizards forgets that those two cards interact. Either way, I’m happy to sell into any Standard-fueled spike instead of waiting around. It’s no secret that I absolutely love bulk rares. I’ve written multiple articles on the subject, and I pride myself on having a pretty solid niche in a community with so many prolific writers. If you’re interested in a couple of primer articles on what I’ve already talked about before we delve deeper down the dime ditch, you can find a piece on “Bulk Rare EDH“, and one on the difference between what I’ve deemed to be “true bulk and fake bulk.” We’re going to touch on a little of both today, in addition to another project that I’m going to be undertaking. 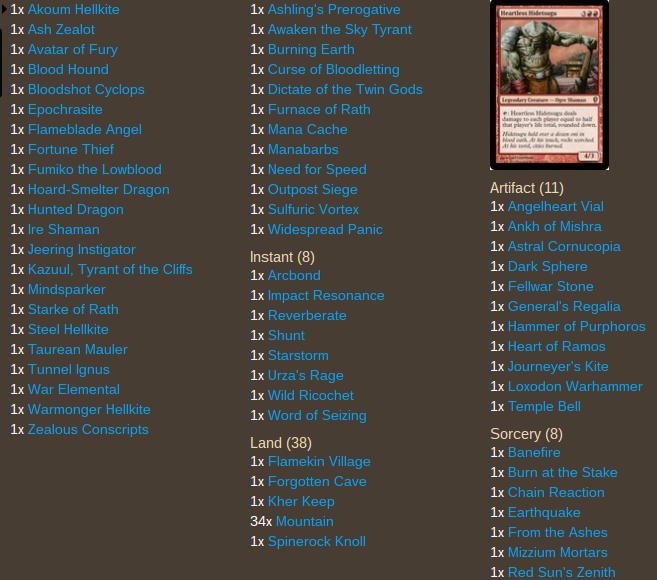 The last time I wrote about Bulk Rare EDH was almost exactly one year ago, and I’ve since taken apart that Tasigur list. It ended up being too frustrating trying to play three colors with next to zero playable mana fixing, since we were locked out of effects like Cultivate and Chromatic Lantern. Half of the deck’s games were lost to mana or color screw, and most of the other half were lost because I was spending the first six turns casting cards like Eye of Ramos and Into the Wilds just to try and find a certain color of mana. I still loved the concept of Bulk Rare EDH though, even if I found out after a quick google search that I wasn’t the designer of the format. So what to do now that Tasigur was a dud? Well, I decided to cut my old rule of excluding the Commander from bulk rare status. That was only a personal exception because I wanted to build banana-man anyway. I also decided to clean up the cut-off point for cards at $1.00 TCG mid, for consistency’s sake; I just promised myself that I wouldn’t use *too many* cards from the dollar box, whatever that meant. So this time, the goal was to focus on a deck with only one or two colors, for consistency’s sake. Thankfully, one of my “Maybe one day” Commander prototypes on Tappedout.net was already being led by a bulk rare, Heartless Hidetsugu. While I didn’t exactly have anyone else who was following my personal rule restrictions, I still wanted the deck to be able to scale with the level of the playgroup to some extent. Hmm… I should definitely trademark that. Maybe call it 76% or something like that? Ruination is right beneath Red Sun’s Zenith in the sorcery section. We can punish those richy-rich folk who want to crack fetchlands thanks to Ankh of Mishra, and Burning Earth will barely affect me considering I’m playing 30something Mountains and only a select few nonbasics. I think my favorite combo will end up being From the Ashes with Ankh of Mishra to kill someone outright after a Hidetsugu activation. While some might complain to me that ending games on turn 6-7 isn’t in the “spirit of Commander”, the upside is that we get in three times as many games! The curve is kind of awkward at the 3-4 drop slots, but c’est la vie. While I was fishing through my bulk boxes to find cards for Hidetsugu and my cube, I decided double up by also pulling out all of the MP, HP, and damaged cards. Some had imperfections that I didn’t notice when putting them in the boxes, but others were damaged by customers not taking very good care of my cards when rummaging through the boxes. I have a setup where I can’t keep an eye on people because my bulk rares are at the shop, but I highly recommend doing so if you have a fat pack or so that you let people skim at FNM. There’s also the whole “theft protection reason”, but if you’re stealing bulk rares than you probably need them more than you need to read this article. I also happily found a large chunk of cards whose prices had increased from the dime and quarter status into the $1, $2, or $5 range. I hadn’t really pawed through this bulk in the past six months (at least), so I was happily surprised that there weren’t any finance hungry sharks who stripped it clean on a weekly basis. I know that the subheading says 1000% growth (implying that I bought all of these at 10 cents each and would sell them for a dollar each), but that’s not always true. It’s not exactly like I plan on being able to sell a dozen copies of Conjurer’s Closet over the next week at $1 each, even if I jam them in my dollar box. Most of the readers of this column don’t have a display case-esque situation, so those readers will likely be hoping to buylist the cards in the below pictures. Even in that situation, you’re still making 300-400% as long as you stuck to the rule of “Buy or trade for English, Near Mint bulk rares that have a gold symbol for ten cents each”. I personally play Dark Impostor in my Marchesa, the Black Rose list and am usually satisfied with how effective he his in the late game. Stealing activated abilities is usually just icing on the cake, and the +1/+1 counter subtheme helps with Marchesa. However, I expect the real demand to be coming from casual vampire tribal, where players are always happy to steal abilities from other creatures and where removal is more scarce. Zombies. Innistrad. Return to Innistrad. Zombies. Need I say more? Oh, right. Mill. Three things combined into one card. Tokens. Four things. While I’m happy selling these out of my dollar box, I don’t fault you for wanting to eek a few more pennies out if you feel like throwing playsets in the spec box and waiting a while. While Mayor of Avabruck was the main Werewinner out of the SOI release (and one that I’ll always feel a pang of regret about when typing), several of the other previously bulk rare Werewolves suddenly transformed into $1 bills. This jumped a few months ago from a silly Modern deck that tried to put Blightsteel Colossus into play. It didn’t work out, but Modern brewers will always tinker (heh) with this kind of effect, and we could see some interesting new artifact mechanics out of Kaladesh. I’m happy with my large percentage jump, but there’s very low risk in holding onto these. River Kelpie‘s movement has become much more vertical than the previous week’s MTGstocks interests have been showing. While it finally joined the dollar rare club, I don’t think this is a card that continues to sit at $1 for much longer. It’s main use is in Marchesa lists like my own, and there’s the looming likelyhood of a new Marchesa in Conspiracy 2. Read River Kelpie a few more times and tell me why it’s not already $4-5. I didn’t get the chance to write about my other bulk rare project, but don’t worry. Next week, I’m going to focus more on my experience foraying into building my first Cube! You get one guess on what the theme is.